Which is why it is great that "Between the Eyes," the current exhibition of abstract painting at Crosstown Arts, stakes no great critical claims. It asks us, instead, to embrace the openness of artistic questions. Make something weird and see where it takes you. Figure out the question after you have the answer. The 14 featured works were brought together by curator Laurel Sucsy, a Memphis-based painter whose abstractions are featured alongside works by Marina Adams, Joe Fyfe, and Rubens Ghenov, among others. Sucsy says that compiling the show was an "extension of what I do in the studio anyway." The works are intuitively paired and quietly presented. Move too quickly and you'll miss all the best things about this show. A good starting place, if you've got an hour or two, is Adams' muddled green-whites and deep indigos in her painting The Wild Feminine. This painting is deceptively simple on first glance, but pay it some attention and it gives a lot back. I have jotted in my notes "this painting makes me want to live inside color." 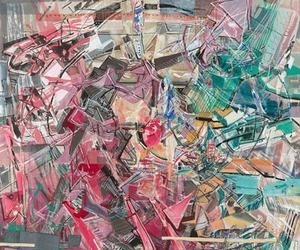 Likewise with another large-scale (74" x 74") work by Adams, Four Worlds, which features several large color fields connected by an undulating line. That one is all about the yellow. Opposed to Adams' work are two large canvases by Iva Gueorguieva. Gueorguieva's paintings are harshly layered with an angular, futurist bent that recalls broken cityscapes. They remind me of drawings by the late visionary architect Lebbeus Woods, whose manifesto claims that "architecture is war." Color and line frantically vie for attention in Vanishing (after Perugino), a yellow-and-black piece built out of shifting planes. This piece is more effective than Gueorguieva's Scarlet Squall, where much of the action of the piece takes place in a weird, circular foreground. Ghenov's paintings are also architectural, but these buildings exist in the uncanny valley. Ghenov makes what I like to call "sky hole" paintings: bits and pieces of geometry that seem grafted onto the infinite. These void-collages couple well with Fyfe's sparse assemblages. Fyfe's so-called paintings strike me as too bare bones to stand alone, but they do interesting things for the rest of the exhibition. Rob de Oude's square canvases are pseudo-mechanical productions of hundreds and hundreds of overlaid lines. The resultant visual effect is something along the lines of what it looks like to take a picture of a computer screen with your phone. As Sucsy put it, de Oude works with "familiar optics" in a way that dissociates them from their usual context. Sucsy's work is a highlight of the show and a touchstone for any experience of the other pieces. During a gallery talk this past week, someone remarked that Sucsy's paintings are "finished with a lowercase f" — meaning that what resolution they have is tenuous at best. Her small abstractions composed of murky diamonds are careworn, worked-over. They have an evasive quality, like afternoon light. The art writer and artist John Berger once posed the question, "Where are we when we draw?" This applies here: Where are we when we paint? A good painting (and there are plenty of good paintings in this show) creates a kind of commons — a place where an artist can share subtle perceptions, extended across space and time. You could easily walk away from any of the works in "Between the Eyes" none the wiser. Or you could live with them.